CBD Pure is a world-class manufacturer and distributor of CBD infused hemp oils. The company claims to follow strict manufacturing guidelines and stringent quality control protocols which ensure that all of their products are of the highest quality. All oils are produced using organic-standard industrial hemp that has been grown in Colorado. This means that their products have a THC content below 0.3% and therefore don’t induce any psychoactive effects. In other words, you don’t need to worry about “getting high.” So without further ado, let’s take an in-depth look at CBD Pure. CBD Pure was founded by a company called Nutra Pure LLC which have operations in Washington, Colorado, and Canada. The CBD Pure hemp oil has been designed with the purpose of promoting personal health and well-being. The industrial hemp that the company uses has been chosen because of its high CBD content. Also, a major plus for this brand is that their oil is backed by a certificate of analysis from SCLabs, which is a sure sign that it’s of the highest quality. Perhaps quite surprising, though, is the fact that they only sell one product; a top-shelf hemp oil extract. So what do we have to say about this brand? 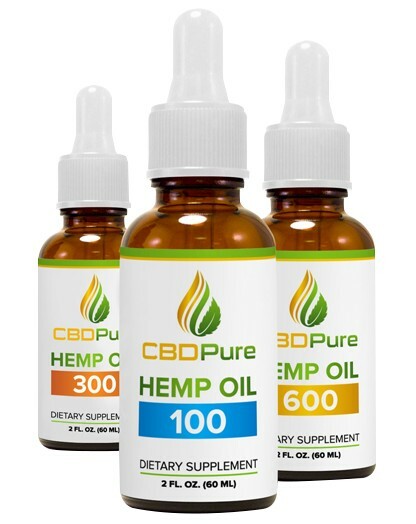 As mentioned above, the hemp oil extract is the only product that CBD Pure sells (well, two if you consider that there’s two different types of oil to choose from). They offer the usual oil which is supplied in a bottle with a dropper, and they also offer the oil in the form of a soft gel capsule for anyone who prefers to get their “mega-dose” in one single serving with the simple convenience of swallowing a capsule. The bottles are available in quantities of 100 mg ($29.99), 300 mg ($54.99) and 600 mg ($79.99), with the largest (600 mg) option being the most cost-effective. The CBD Pure oils contain naturally occurring CBD, which is the main therapeutic cannabinoid found in hemp. The 100 mg bottle of oil provides 3.3 mg of CBD per daily serving, the 300 mg bottle has 10 mg per serving, and the 600 mg bottle has 20 mg per serving. The biggest serving is best for chronic pain, since the smaller bottles are more likely to be effective for mild conditions. The CBD content is not high enough to treat more serious conditions like epilepsy. The Hemp oil is consumed by using the dropper that is supplied with the bottle – it’s suggested that you take half a dropper (1 g) twice a day. The soft gels, on the other hand, are easy to swallow and can be consumed just like any other daily vitamin. CBD Pure are not ones to boast, as they prefer to use word of mouth to get the and let the product promote itself. On their website, though, you will find a “success stories” tab that shares some phenomenal stories from consumers that have used the products. Focused on mental health and personal well-being, CBD Pure is great for anyone who suffers from anxiety, depression, or even just the daily stresses that life can bring. However, it’s also been known to provide incredible benefits for chronic pain. In addition, CBD Pure claims that their oil relaxes the body by promoting and balancing the endocannabinoid system, promoting cardiovascular health, and improving the overall functioning of the body’s internal systems. One particular consumer claimed that after ten years of not participating in competitive swimming due to chronic pain, the CBD Pure hemp oil enabled her to get back into the pool five days a week because of the incredible pain relief that it provided. Another consumer claimed that the hemp oil brought their passion for music back to life, and gave them the motivation to start playing the guitar again. In all honesty, it’s not that surprising that CBD Pure is getting great feedback since their products are produced from naturally grown organic hemp, meaning the end product is of the highest quality. Your best bet is to order directly on the CBD pure website. You can also find a more in-depth overview of the products here. One important thing to note is that CBD Pure does not ship internationally, and they also do not ship to Louisiana, Kentucky, Indiana, or Arkansas. On the plus side, though, they do have a 90-day guarantee and claim that the consumer’s satisfaction is their top priority. Therefore, if you don’t experience the therapeutic benefits that you expect, or are simply not happy with the results, you can send your order back within 90 days of the purchase and get a full refund. There is still a great deal of research being done on the cannabis plant and its various benefits, but thus far, it seems that you can’t go wrong with CBD. All studies indicate that this is a miraculous compound that provides incredible health benefits, with virtually zero negative side effects. However, the increase in CBD infused products in the market has posed a big challenge when it comes to selecting the right hemp oil. It’s always important to do your research and make sure that the product you are looking at is fit to serve your medical needs. And lastly, the most important thing to consider is the safety and quality of any hemp oil that you intend to buy. In this regard, we don’t think you could go wrong with CBD Pure.